U.S. Visitor and Immigration Status Indication Technology (US-VISIT) system is designed to keep track of visitors to the United States. It in effect on at 115 airports in the U.S, Canada, Caribbean and Europe, and at 15 seaports in the U.S and Canada. The program applies only to foreign nationals entering the US on temporary visas, including those participating in the Visa Waiver Program. It does not screen diplomats, children under 14, and adults over age 79. The US-Visit Program is, in essence a "check-in" and "checkout" system that allows the Department of Homeland Security to collect biometric identifiers as part of their inspection process. Biometric data (fingerprint and digital photo) is collected on visitors when they check in and out of the United States, and scanned against law enforcement and national security data bases. The Arrival/Departure Information System (ADIS) will electronically show whether they have complied with the departure terms of their admission. Their personal data will also be checked against electronic lookout lists for law enforcement and security purposes. The government will store the images and other information in its data systems for such future use as intelligence, security, criminal investigation, or confirming visa compliance. Therefore, while the data will be used primarily by DHS and DOS (Department of State) officers, it may be made available for law enforcement purposes to other government agencies, U.S. and foreign. 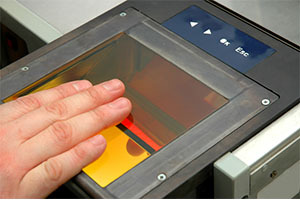 On arrival, individuals will provide two fingerprints on an inkless device, and a digital photograph will be taken. This information, combined with the normal document review, will determine whether the individual will be admitted into the U.S. and issued a Form I-94. When the individual leaves, their travel documents are scanned, the photographs are compared and new fingerprints are taken. A person who fails to comply with the departure requirements may be found in violation of his admission, parole, or other immigration status. Such failure may also be considered in deciding whether that individual is eligible for a nonimmigrant visa or admission in the future. Failure to comply can also result in a finding of overstay where the visitor has failed to depart when his authorized stay has ended. Thus, the days when government inefficiency failed to keep track of those overstaying their authorized period of stay appear to be over. Overstaying one's period of authorized stay has serious implications for future visits, including the cancellation of one's visa and subjecting the violator to possible long-term bars against re-entry to the United States, even if eligible to immigrate.